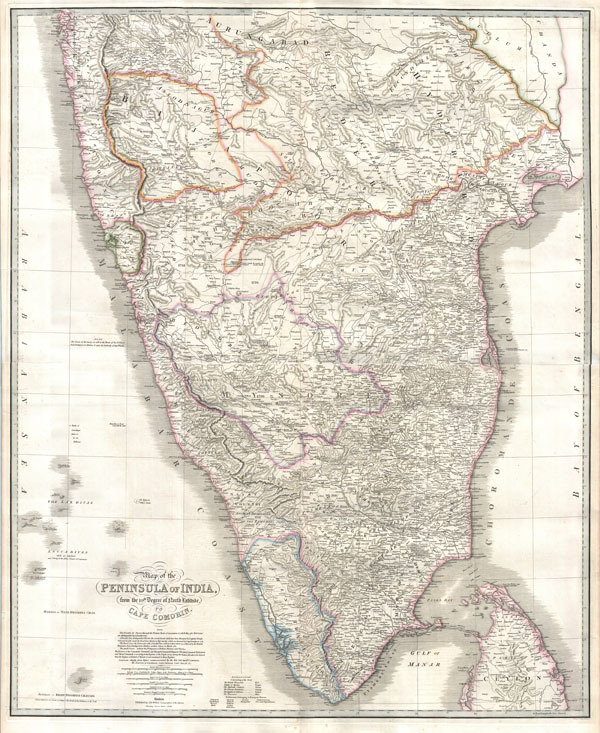 Possibly the finest map of southern India to appear in the 19th century. Map of the Peninsula of India, from the 19th. Degree of North Latitude, to Cape Cormorin. This stunning wall map of India, dating to 1838 is James Wyld's reissued of William Faden's important c. 1799 map of the same region. This is one of the largest and most impressive maps of India to emerge in the 19th century. This chart depicts the subcontinent from Bombay ( Mumbai ) and Aurangabad, south including the northern half of Sri Lanka (Ceylon). Though largely based on the 18th century mapmaking work of James Rennell, Wyld has significantly updated the Faden's cartographic representation of India by incorporating the survey work of Sir Archibald Campbell, Col. Kelly, Captain Pringle, and Colonel Allen. Consequently the issue of this important map marks a significant advancement in the 18th century perspective of India. The subcontinent is now crisscrossed with a broad network of roadways and significant interior detail has been added throughout. Here and there on the map are notes regarding the dates and battles related to the British conquest of India in the 18th century - these as well as the overall structure of the map have been retained from the original Faden map. Wyld, J., A new general atlas of modern geography consisting of a complete collection of maps of the four quarters of the globe delineating their physical features and coloured to show the limits of their respective states : including also the latest geographical and nautical discoveries, c. 1838. Very good. Professionally flattened. Two sheets joined.